Your skin needs extra TLC in Winter so why not treat it to some extra sheet masking! The perfect way to unwind when you’re having a night in to escape the cold. Our Winter Sheet Mask FaceIt Box contains 10 assorted Korean beauty sheet masks to keep your skin healthy, relaxed and smooth. *Innisfree My Real Squeeze Tomato & Broccoli are now sold out. They will be replaced with another Innisfree My Real Squeeze Coconut & Shingmulnara Tea Tree Natural Delight Mask Sheet. Discover more of our curated Korean skincare sets here. Treat your skin this winter with our specially curated Korean Beauty Winter Sheet Mask Set. 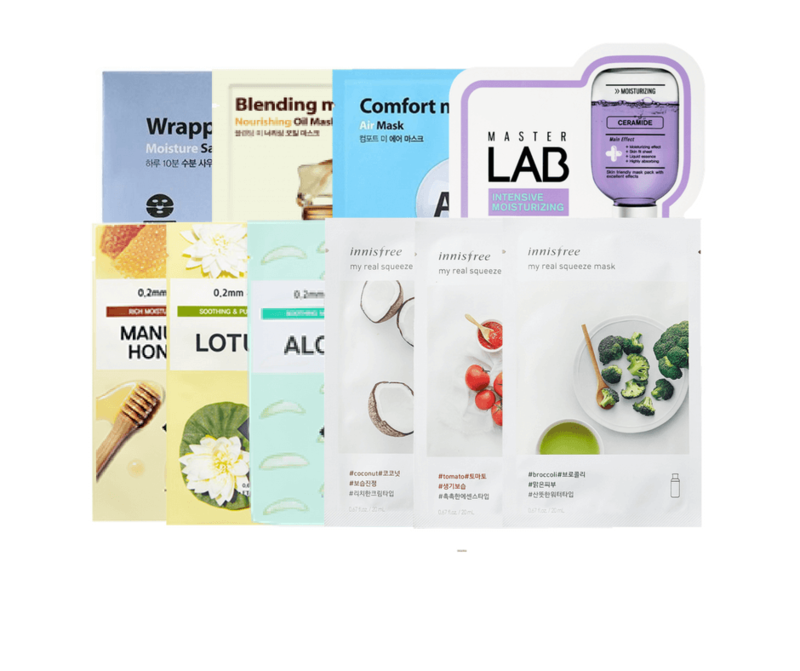 This set includes assorted sheet masks by Korean Beauty brands, each with different key ingredients. These sheet masks deliver a variety of nutrients to protect and strengthen your skin barrier. Some key ingredients include Manuka Honey, Facial Oils,Aloe, Coconut and Ceramide to save your skin from dehydration, dullness and dry this winter. 1x Make P:rem Wrapping Me Sauna Moisture Mask. 1x Make P:rem Blending Me Nourishing Oil Mask. 1x Make P:rem Comfort Me Air Mask. 1x Tony Moly Master Lab Ceramide Mask Sheet. 1x Etude House 0.2 Therapy Air Mask Manuka Honey. 1x Etude House 0.2 Therapy Air Mask Lotus. 1x Etude House 0.2 Therapy Air Mask Aloe. 2x Innisfree My Real Squeeze Mask Coconut. 1x Shingmulnara Tea Tree Natural Delight Mask Sheet. These assorted sheet masks can be used on a daily or weekly basis, or as as an occasional pick me up! Best used after cleansing and exfoliating. If you intend to rinse your face after your sheet mask (may occur after using the Make P:rem oil & air masks), save toning and your other skincare steps until after you rinse. For the full ingredients list of each product in this box, please visit the individual product pages as linked above.